Good morning! How are you friends? I know here in California we've got a lot of summer left, but Labor Day weekend always feels like the end of the season to me. Was it fun? 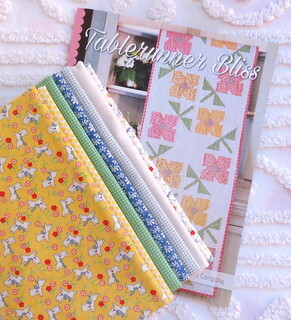 Today is the first day of the Tablerunner Bliss Sew Along. 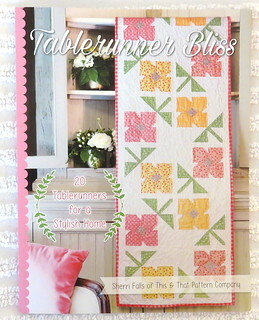 Sherri's book is full of great tablerunners for all occasions. The first in the book is Blossom, and you can check that out over on Anorina's blog today. Buttercup is the second tablerunner in the book and I couldn't resist going with some yellows for this tablerunner based on the name. Fat Quarter Shop invited me to select some Moda fabric for my runner, and I chose from the 30's Playtime line by Chloe's Closet. Those little dogs caught my eye right away and I knew I had perfect props to go with it! I can't resist the cheerfulness of 30's reproductions. Buttercup sewed up so fast, and I think it turned out so cute. It's a quick project to stitch up and I quilted it myself with a lot of stitching in the ditch quilting. I love a project that it bite sized, that you can cut and sew without really having to think about it too much. I love sewing! You can follow the #tablerunnertuesdays and #tablerunnerbliss hashtags on Instagram to see all the pretty tablerunners! Grab a book and make a runner, and add the hashtag so we can see what you're making! 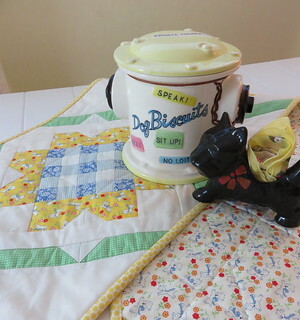 Those 30's fabrics with the little scotty dogs are adorable! Your Buttercup runner turned out so cute. What a great project! Your runner turned out very well. So pretty with the yellow. Adorable!! And a Scottie that I don't have! Stay cool out there!! In MO it was 90 yesterday and high 70s today, hopefully the 70s last for a while. I love this idea for a blog hop - "do-able" projects that fit into a working woman's weekend schedule! Thanks for sharing your great runner. 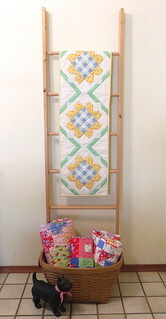 I loved seeing it hanging on the quilt ladder. Warning: This post may contain complaints.